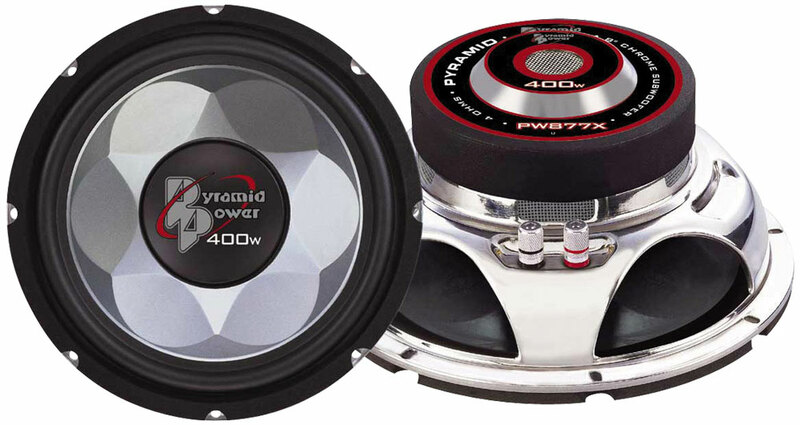 The Pyramid Power Subs are built to add low punchy powered bass to a system.. The unique hexagonal cone structure gives greater surface area for deeper bass. The cone is extremely light and rigid with excellent structural support. This gives great response making them an excellent choice for all round bass use. Amp Requirements: The Single 4 Ohm Coil mean the best amp to power one of these is a bridged 2 Channel or the two rear channels bridged on a 4 Channel Amp. Minimum 200w RMS is advised - many people do not realise under powering a speaker will kill it very quickly! It will run very happily on 275w RMS and will take up to 350w RMS without problem.